There's a whirlpool of prizes waiting just for you at Foxy Bingo! So grab your swim-suit and prepare to dive into Foxy Bingo's £100K Cash Splash! Now you won't have to wait until Summer to dust off your swim-wear and take a dip in the pool. As Foxy has created a brand new sun-drenched game where you can go for a splash in it's awesome pool of bonus prizes! You can enjoy the Cash Splash game every day this week until 11.59pm on 28th February. The best part is that everyone will win a super cool prize! The bonus prizes range from just 50p right up to £100 every day! 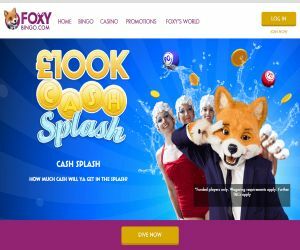 To dive into the action, make sure you log into Foxy every day of the promotion, from your mobile or PC and play the Splash Cash game. The game is inspired by the latest Cash Splash video, which is filled with gorgeous ladies in red swimming costumes diving straight in the water! You can soak up all the fun and watch as they grab bingo balls and coins for you in the Cash Splash game! The best part is you can win your splashing share of £100,000 worth of bonus funds! There's no time like the present, so ‘go on, see how much cash' you can grab from the splash!